The origins of this village -today integrated by the urban nuclei of Osma and Burgo of Osma- go back to the Celtiberian and Roman city of Uxama - Argelae, mentioned, among other classic historians, by Plinio. In the 8th century the Arabs took the city and built a watchtower. Uxama was gradually abandoned and, in parallel, the urban nucleus of Osma, adjacent to the old Uxama, was created. At the same time, on the hill next to Uxama, the current castle was built between the 10th and 11th centuries. In these centuries Osma suffered the ups and downs of its strategic situation in the Douro river, with the alternative domain of Muslims and Christians, until the year 1088, when Alfonso VI ordered its repopulation. There is no documented evidence of the presence of el Cid in Osma, although it can not be ruled out as he was warden of the neighboring Gormaz. On the other hand, El Cantar cites the neighbor Alcubilla del Marqués, to the west, and Navapalos, south of Osma, at 6 and 11 km respectively. 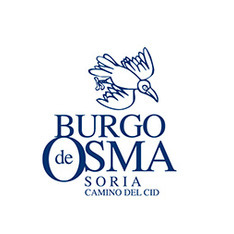 The creation of the Borough of Osma (Burgo de Osma) takes place in 1101, when Bishop Pedro de Burges, beatified as San Pedro de Osma, ordered to build a cathedral in the outskirts of Osma, around which the current urban nucleus will be created. Burgo de Osma is a monumental city of recognized gastronomy with an episcopal seat since the 12th century. Of its importance it gives account the fact that in century XVI it counted with a university (University of Santa Catherine). This fact is manifested in the good number of manor houses and religious buildings you can see today. It is worth to walk quietly through its streets and cross the walls to finally reach the sidebank of the Ucero River, although the most striking element in the city is the imposing bell tower of its cathedral. Although The building is predominantly of Gothic style, this cathedral was built on the primitive Romanesque, partially demolished in 1232, of which the chapter house and some canvases are conserved. The Romanesque sculpture of the Holy Christ of the Miracle, the Gothic polychrome stone sepulcher of San Pedro de Osma or the Renaissance altarpiece by Juan de Juni and Juan Picardo, are other surprises that await anyone who goes to the Cathedral of El Burgo. The Gothic cathedral keeps among its many treasures a Beato written by the clergyman Pedro and miniaturized by Martino in 1086. It is considered one of the most precious codices of the eleventh century. The Beatus contains a world map that reflects very well the spiritual geography of the time. Apparently this world map was painted in the year 1086, under the reign of Alfonso VI. The original Beatus is not exposed to the public for security reasons, but you can always get to know first-hand some curiosities about the fascinating history of this book.